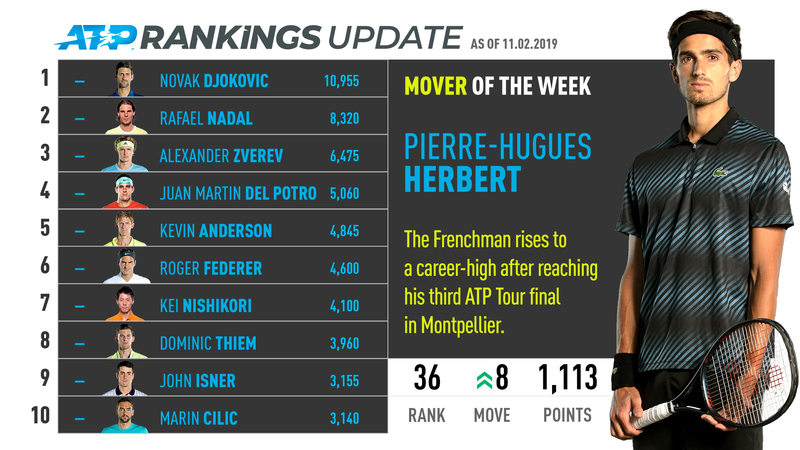 Pierre-Hugues Herbert reached his third ATP World Tour singles final at the Open Sud de France, dropping just one set en route to the championship match. The seventh seed, who also finished as runner-up in Winston Salem in 2015 and Shenzhen last year, defeated Denis Shapovalov and Tomas Berdych in back-to-back matches, before falling to countryman Jo-Wilfried Tsonga in the final. With an 8-3 record this season, Herbert rises eight places to a career-high No. 36 in the ATP Rankings. Herbert’s strong start to the 2019 ATP Tour season has been inspired by doubles success. The 27-year-old captured titles in Doha (w/Goffin) and at the Australian Open (w/Mahut) last month. By defeating Henri Kontinen and John Peers in the Australian Open final, Herbert and Mahut became the eighth doubles team in history to complete the Career Grand Slam. After opening the 2019 ATP Tour season with a 3-3 record, Marton Fucsovics advanced to his second tour-level championship match at the Sofia Open. The 27-year-old Hungarian, who lifted his maiden ATP Tour trophy last year in Geneva (d. Gojowczyk), defeated eighth seed Andreas Seppi in straight sets before three-set wins over Yannick Maden and Matteo Berrettini to reach the final. Fucsovics jumps nine spots to No. 38 in the ATP Rankings, just three places shy of his career-high No. 35 position achieved on January 7. Tomas Berdych continued his strong return to the ATP Tour in Montpellier. After missing six months of the 2018 ATP Tour season due to a back injury, the Czech improved to 10-3 this year with a run to the Open Sud de France semi-finals (l. to Herbert). The former World No. 4 built on his runner-up finish in Doha (l. to Bautista Agut) and fourth-round appearance at the Australian Open (l. to Nadal), with victories against Matthias Bachinger, Benoit Paire and Filip Krajinovic. Berdych soars 20 positions to No. 59 in the ATP Rankings. On his tour-level main draw debut at the Cordoba Open this week, Juan Ignacio Londero stunned the field by claiming his maiden ATP Tour title. The Argentine wild card did not drop a set en route to the final, before rallying fron a set and a break down to beat countryman Guido Pella in the championship match. Londero leaps 43 places to a career-high No. 69 in the ATP Rankings.